Theme Day for the City Daily Photo Blog community is best photo of last year. One of my favorite photos of 2011 is this one I took in the Public Garden last May. To view other photos click here to view thumbnails for all participants. 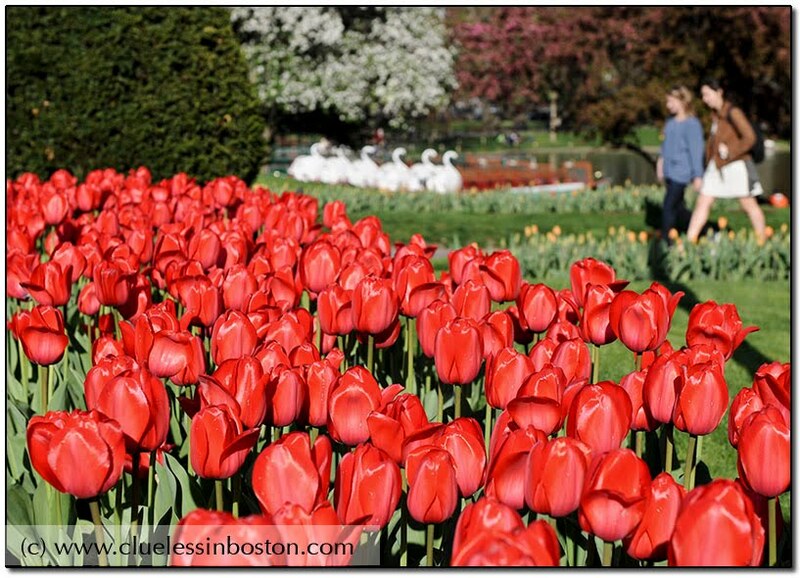 High spring in Boston Public Garden- great choice! Many of your viewers need a jolt of springtime color. This is a good shot. Hope your 2012 is great. Absolutely beautiful!! Happy New Year! makes me ready for spring! happy new year! What flower is that? Beautiful . May this New Year be for you like this picture: joyful, colorful, and beautyful! and it is really nice! it really is a wonderful capture. Great choice for the theme. So much subliminal symmetry going on in this image! Wishing you the very best for the year ahead. A colorful choice! Enjoy 2012!! And there in the background are the wonderful Swan Boats, straight out of McClosky's "Make Way For Ducklings". Yes this one deserves to be Photo of the year. The foreground is stunning and the two passers-by perfectly placed. ... love the row of swan necks too!